The Department of Ecology, Evolution, and Natural Resources (DEENR) provides a wide variety of research opportunities for students in the 704 major. DEENR undergraduate student researchers study lizard endocrinology, ethnobotany and herbal medicine, resistance of diatoms to infection, bioinformatics of algae, gecko behavior, archeology, and cataloging native bee diversity. Undergraduate Serena Celestino wins the Rutgers 2018 Intern Excellence Award. Undergraduate Gloria Blaise surveying neighboring areas of HMF and RUEP to investigate whether usage and accessibility impacts user's/visitor's perception and knowledge of a forest site. Undergraduate Ramya Kappagantula is studying the invasion dynamics of non-native pests. Rosy Tucker is a senior majoring in Ecology, Evolution and Natural Resources researching landscape level effects on the distribution of rare bee species across different habitat types in New Jersey. Undergraduate Joseph Zientek's research focus is on native pollinators and how they interact with plants. 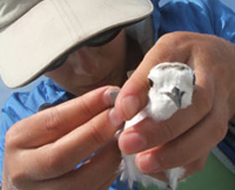 Undergraduate Amanda Bevan is a senior majoring in Ecology, Evolution, and Natural Resources. Undergraduate Carmela Buono is a senior majoring in Ecology, Evolution, and Natural Resources and joined the CURE (Center for Urban Restoration Ecology) laboratory in 2015. Her main interests are in exotic plant invasions and their effects on restoration of urban forests. STUDENT PROFILE: Kurtis Himmler, student invertebrate expert extraordinaire. Students can earn independent study credits for their research projects. Other students are paid by project grants; in other cases students receive funding through several Rutgers University programs designed to support students interested in research (see links below). If you are a student interested in finding research opportunities, please refer to the EENR faculty page.